our first view of uluru. it’s really crazy how time flies. we are only a couple weeks away from this year’s anniversary trip, and i haven’t even gotten through posting about last year! 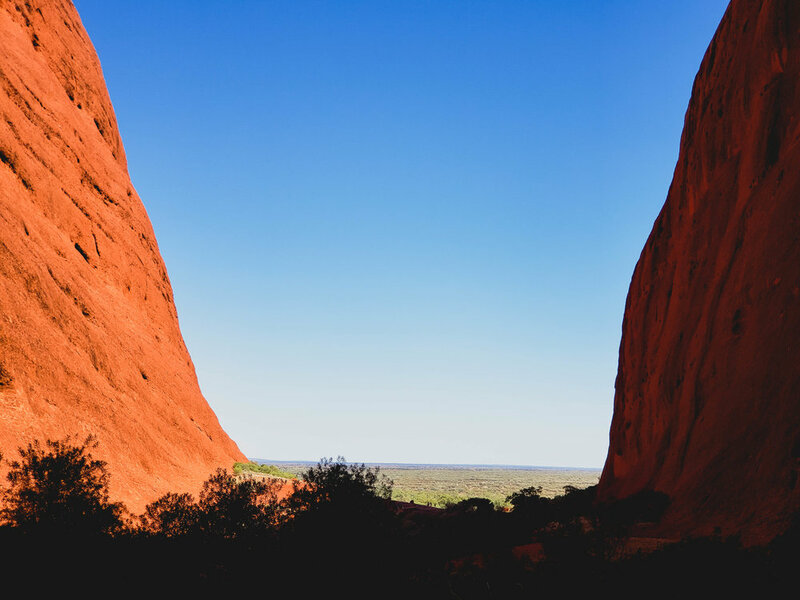 our last stop in australia’s outback was uluru and kata tjuta national parks - two very different but equally magnificent rock formations that are sacred to the local aboriginal people. we stayed in the town of yulara, at sails in the desert, which is a part of ayer’s rock resort (which is the only place to stay in the area, but they have all levels of accommodations from campgrounds, to apartments, to full resort-style living). also, after we arrived in the area, i realized my camera had died, so all the photos in this post and the rest of our time in australia were taken from my phone. kata tjuta aka the olgas from afar. getting closer to kata tjuta, from a different angle. the drives to each site meanders a bit around them, which helped give a sense of scale, but also kept changing our perspective on them. we headed out to kata tjuta first. getting closer to kata tjuta. we did just one of the walks here. the scale is hard to convey, but these rocks were quite massive and imposing. i was very surprised by how much LIFE there was, as we were there at the tail of their summer and it was definitely very hot and very dry. looking back out, tiny people for scale. from kata tjuta, we made our way over toward uluru, which is a massive, single rock the size of a small mountain. the sheer scale of it defies comprehension honestly. the climb you shouldn’t do. at some point in the past, before the govenrment returned the land to the aboriginal people, they put a trail up the side of the mountain. now they ask people to not climb it out of respect, as climbing it is actually a very special rite of passage in their belief system, but of course, there were quite a few people climbing it the day we were there. we stayed on the ground and did the mala walk - there were caves with ancient paintings, kitchens and markers explaining some of the history, stories and spiritual significance of the rock. some spots are still considered sacred and they ask that you don’t take pictures of them. getting up close and exploring the base around uluru was very different from what we expected from seeing it from afar. we’re so glad we did it! after our explorations, we returned to our hotel to freshen up before the evening’s activities. we had booked a sunset dinner with views of uluru followed by a walk through an art installation called field of light. sunset dinner, the white specks beneath the trees in the distance are the light installation. dinner was great, but the art installation was AMAZING. it’s 50,000 color changing lights, and when it gets dark in the outback you can see ALL. THE. STARS. i couldn’t capture it on my phone obviously, but seeing this crazy colorful light field underneath the milky way was truly remarkable and one of the highlights of our entire time in australia. we had a great day exploring uluru and kata tjuta, but it was time to move on. the next morning we returned our rental car at nearby (and tiny!) ayers rock airport and hopped on a flight to our next destination: melbourne!